A simple redesign could be the end of soggy delivery pizza forever. The current pizza box design puts a hot pizza in a fully enclosed cardboard box. The steam and resulting moisture are trapped inside, making the crust soft and soggy. There are vent holes in the sides, but steam doesn’t move sideways; it is released from the top and bottom of the pie. 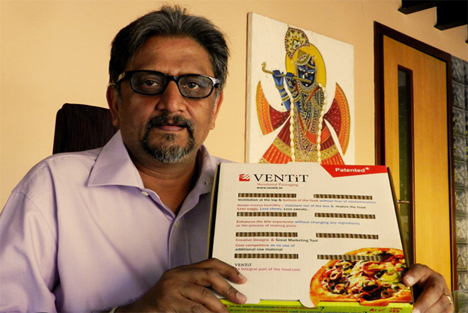 Vinay Mehta had a stroke of genius and created a brand new pizza box that will keep your pizza fresh and tasty on its way to you. Mehta knows his cardboard: he’s been working with it for 35 years. His new box design is called VENTiT. The first prototype was created in 2006 when Mehta got tired of soggy delivery pizzas. 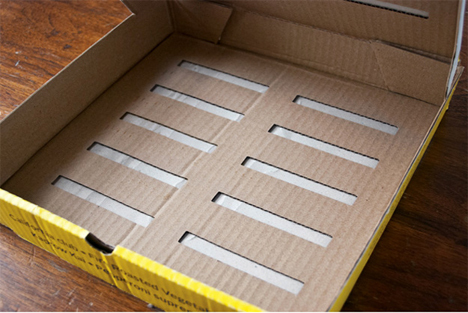 He used a pen knife to cut vents in a piece of cardboard and the VENTiT idea was born. It took him five years to get the initial patent for the box, but the design is now patented in over 100 countries. The main reason that pizza boxes don’t already have vents in their tops and bottoms is the fear of contamination. Mehta’s idea eliminates that worry. He explains that cardboard is composed of three layers: two flat surfaces with a ridged layer in between. The VENTiT simply has cutouts in the two flat surfaces, but the middle layer is intact. Steam can escape through the ridged layer, keeping your pizza hot, fresh, and tasty. The VENTiT requires no additional materials to produce, making this revolutionary idea a realistic alternative to the old pizza box design.